Gen. John Kelly, then commander of the US Southern Command, briefed the media on March 20, 2013. When a fledgling group wanted to build a memorial to honor military service members from Massachusetts killed since the Sept. 11, 2001, attacks, they asked Brighton native John F. Kelly to be the star attraction at their first fund-raiser. The US Marine Corps general delivered that night in December 2010, showing up in his dress blues at the Boston Convention & Exhibition Center and giving a powerful speech about the lost service members and the Gold Star families that loved them. Kelly never mentioned to the grieving crowd that he had just become one of them. Three weeks before, a bomb had killed his son in Afghanistan. 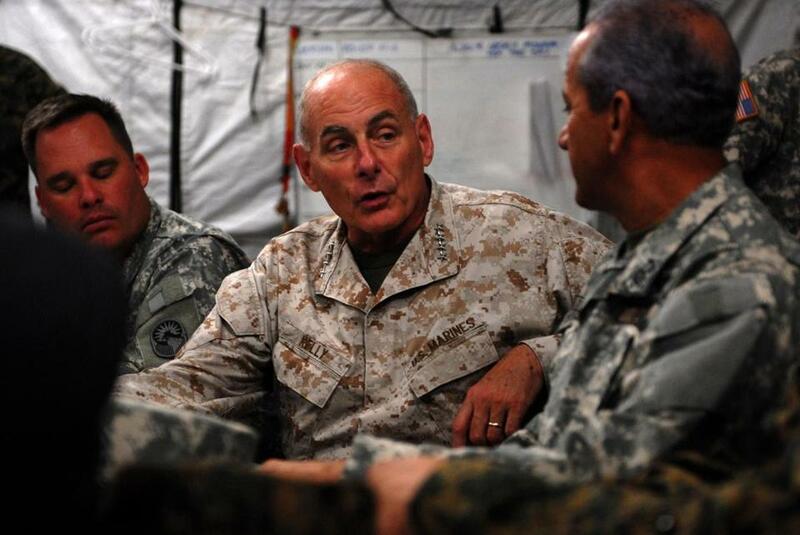 On Wednesday, President-elect Donald Trump nominated Kelly to be Homeland Security secretary, barely a year after the 66-year-old general ended a long and distinguished career with the Marine Corps. Kelly served in the Marines for more than four decades, including three tours in Iraq, traveling so far from Boston that his accent has long since faded. But in Massachusetts, he is remembered fondly as an adventurous Irish-Catholic son who reached the highest echelons of military service yet remained humble and accessible to civilians and service members alike. As a teenager coming of age in the turbulent 1960s, Kelly hitchhiked across the country to Washington state and then rode the freight trains back, according to the Marines’ website. He also joined the Merchant Marines and said his first trip overseas was to deliver 10,000 tons of beer to Vietnam. When his mother warned him that his draft number was about to come up, he enlisted in the Marines in 1970, which was “the only way to serve for any self-respecting Irish-Catholic from Boston,” Defense Secretary Ashton Carter said of Kelly at a ceremony in January before the general retired. Carter called Kelly a “dedicated, principled” leader with a remarkable ability to relate to civilians and troops alike. Kelly, who graduated from the University of Massachusetts Boston, retired in February after three years at the helm of the US Southern Command, which oversees US interests in Latin America and the Caribbean, handling everything from hurricanes to human smuggling. Many in Massachusetts breathed a sigh of relief that Kelly, if confirmed, may lead a sprawling agency that oversees immigration, the Transportation Security Administration, and terror investigations. Many had feared that Trump would nominate a combative figure for a complicated job that requires negotiating with 50 states and thousands of mayors. With Kelly, “you’ve got an adult in the room,” said Juliette Kayyem, a former assistant secretary for Homeland Security and author based in Cambridge. Former Boston police commissioner Edward F. Davis, once thought to be a contender for Homeland Security under the Obama administration, said he was pleased by the nomination. Kelly was back in Boston in May when he helped the Massachusetts Fallen Heroes unveil its memorial in the Seaport District. The memorial bears the names of more than 200 Massachusetts men and women who died in service since the 2001 terror attacks. The memorial offers their families — called Gold Star families — a place to gather and grieve, and serves as a reminder for future generations. The general did not ask for it, but the organizers included the name of Kelly’s late son, Robert, 29, who had followed his father into the Marines. “In all of our eyes, they’re a Boston family,” said Dan Magoon, a Boston firefighter and executive director of the Massachusetts Fallen Heroes.